Starting this weekend, Los Angeles County Metro (Metro) will be running trains on the Foothill Gold Line during the daytime hours between the Sierra Madre Villa and APU/Citrus College Stations, as they continue to “burn in” the new Kinkisharyo 3010 vehicles. As you likely know, Metro has been running trains in the late afternoon/evening hours since taking possession of the Foothill Gold Line on September 24. With this change, trains will be running throughout the day and night – Sunday through Thursday. Metro has also let us know that starting mid to late-January, they will begin Pre-Revenue Operations. Pre-Revenue Operations is the final phase of work before passenger service begins, and during this period trains operate on their future schedule. Metro plans to run Foothill Gold Line trains at 12-minute headways (the time between trains) during the morning and afternoon peak periods; less often during the off-peak periods. Through all of this, Metro will continue to place their Ambassadors at the different street crossings to educate the community on how to stay safe. They will continue to have Ambassadors along the corridor until several months after passenger service begins on March 5, 2016. 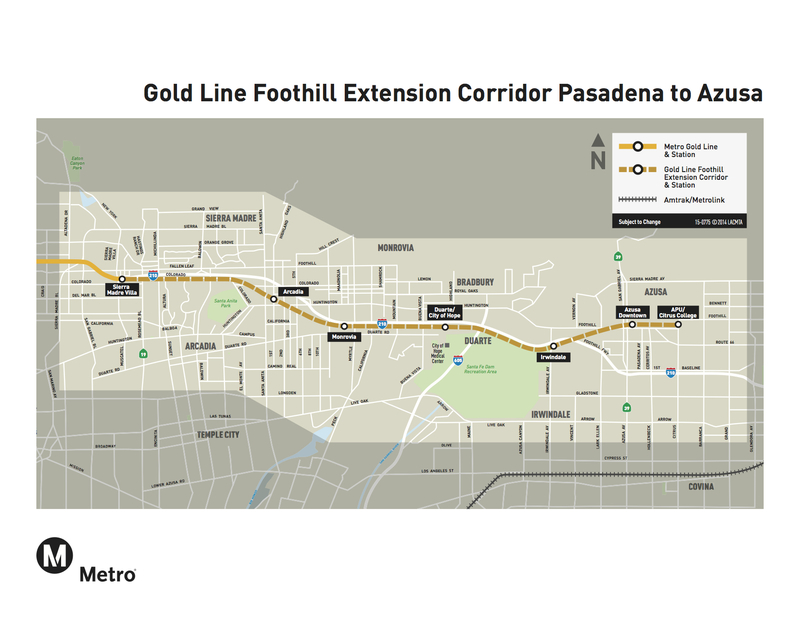 Will the Regional Connector Project Closure in Little Tokyo in January 2016 impact in any way the start date/schedule of passenger services of the Foothill Gold Line? At any rate, trains will NOT be originating from the Atlantic Avenue station. Are people that stupid they have to be told it’s unsafe to walk in the path of a Light Rail Train? We had street cars and interurban trains here previously which at times ran at over 50 mph between stations (stops) all without rail road crossing gates with few injuries. Was watching an old documentery and in it were people casualy walking across the street as a street car turned the corner with no one being hit. Perhaps those born in the 1960’s and later should have worn crash helmets from birth since it appears they are mentally challenged. Are you really asking that question? The answer is YES!!! If you recall about a week or two ago, two separate incidents happened where people were hit by trains and killed. One was on the Gold Line near the Little Tokyo Station and the other was on the Blue Line between the Washington and Vernon Station where it’s on it’s own RIGHT OF WAY!!!! Metro believes that both incidents may have been suicides. Steve, and it’s not just rail where people attempt and are sucessful in killing themselves. I had two investigations in downtown within a month only a few blocks apart where the vicims(?) dove under the wheels of a bus.